Fine, John Van Antwerp. The Early Medieval Balkans: A Critical Survey from the Sixth to the Late Twelfth Century. Ann Arbor, Michigan: University of Michigan Press. 1991. ISBN 978-0-47-208149-3. Brooke, Z. N.; Tanner, J. R.; Previte-Orton, C. W. The Cambridge Medieval History:Contest of Empire and Papacy V. Cambridge University Press. 1968. Kaldellis, Anthony. Streams of Gold, Rivers of Blood: The Rise and Fall of Byzantium, 955 A.D. to the First Crusade. Oxford University Press. 2017. ISBN 0190253223. Kennedy, Hugh N. The Prophet and the Age of the Caliphates: The Islamic Near East from the 6th to the 11th Century 2nd. Harlow, England: Longman. 2004. ISBN 978-0-58-240525-7. Lev, Yaacov. The Fatimids and Byzantium, 10th–12th Centuries. Graeco-Arabica. 1995, 6: 190–208. OCLC 183390203. Stephenson, Paul. The Legend of Basil the Bulgar-Slayer. New York: Cambridge University Press. 2003. ISBN 0-521-81530-4. Stevenson, William B. Chapter VI. Islam in Syria and Egypt (750–1100). (编) Bury, John Bagnell. The Cambridge Medieval History: Contest of Empire and Papacy V. New York: The Macmillan Company. 1926: 242–264. Whittow, Mark. The Making of Byzantium, 600–1025. Berkeley: University of California Press. 1996. ISBN 978-0-520-20496-6. Holmes, Catherine. Basil II and the Governance of Empire (976–1025). New York: Oxford University Press. 2005. ISBN 0-19-927968-3. Chisholm, Hugh (编). 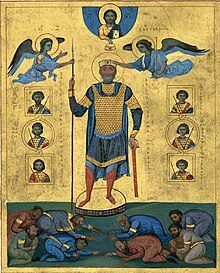 Basil II.. 大英百科全書 第十一版. 劍橋大學出版社. 1911年.